This hike begins on Forest Road #20. 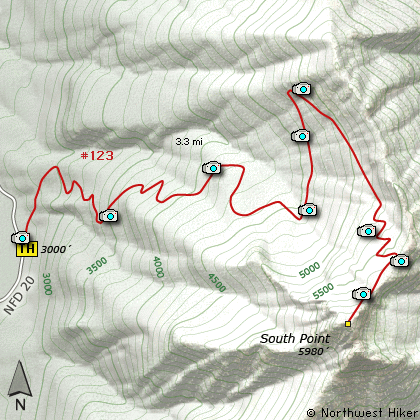 Keep in mind that this hike climbs nearly 3000' in about 3 miles. Therefore, the trail begins its steep ascent immediately. Almost all of this hike is in dense forest. Much of the trail actually follows old logging roads as it makes its way up South Point Mountain. Not until about 2.5 miles and 2000' of elevation do you get any respectable views. At that point you also get great floral displays in season. Over the next mile you get to climb the last 1000 feet and it is not until the end that you get your reward. And what a reward you get! This mountain is so steep and the top is so precarious that it is almost like being in an airplane. Be aware that you might encounter snow, even in late July. I didn't make it the last 300 feet because of the snow. The snow was hard and very very steep, so I didn't climb it to the top. But I did get a photo of a life time, so it was worth it. Travel east on US Hwy 12 for about 48 miles to Randle. From Randle travel east on US Hwy 12 for about 12.5 miles to the junction with Forest Road 20. Turn right (south) onto FR20 and follow it uphill for about 4.3 miles. At this point you will see a road continuing straight ahead, but stay on FR20 and follow it to the left over the creek and about a half mile further, and you will see the trailhead for this hike on your left.